Sampson, who also serves as President of the Heron’s Landing Condo Association Board, said the community was forced to reach out to an independent structural engineer for help, because DR Horton downplayed the severity of the problems. Sampson joins a parade of witnesses who have attested to a range of construction defects at the 240-unit development. Residents have testified about poor soundproofing, inadequate drainage, air conditioning failures, broken plumbing, even garage doors falling off. The company notes the buildings passed inspection and were certified by the city of Jacksonville. The lawsuit, filed in 2013, is unusual because construction defect claims are typically handled in secret arbitration proceedings. Virtually every new home contract prohibits owners from suing in open court, and instead forces them into a closed hearing with the builder. Because this case was filed not by individual condo owners, but by the condo association, the claim is freed from those limitations. Magistrate John Sampson testifed the Heron's Landing community sued the builder because "we are trying to get what we paid for -- a livable building that would be there for 30 years." Residents are asking for $9 million to repair the condos. Attorneys for D.R. 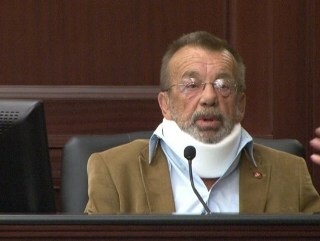 Horton declined to discuss the case. A spokesperson from the company’s Texas headquarters said it is company policy to handle all media inquiries in writing, but they issued the following statement: D.R. Horton is committed to superior customer service and providing families with quality homes and neighborhoods in North Florida. While we do not believe the community has the construction defects alleged in the lawsuit, D.R. Horton intends to fully cooperate with the legal process. The lengthy and complicated trial began with jury selection on April 12. It is expected to last at least another week.